I’m a bit disheartened at the reaction Warm Bodies has been getting from gore hounds who didn’t even bother to see the film. “It’s Twilight with zombies!” they all exclaim in between a plethora of cuss words. First of all, I don’t get what’d be so terribly wrong with that. Second, Jonathan Levine’s offbeat feature is clearly being advertised as a romantic comedy, whereas The Twilight Saga has turned out more of a romantic unintentional comedy. Do horror fans realise love stories have existed long before Stephenie Meyer came along? In fact, Warm Bodies draws inspiration from one of the most celebrated romances of the past four hundred years: Romeo and Juliet. By this, I mean that the movie makes a few overt references to the Shakespeare play but spends most of its runtime exploring the thematic opportunities offered by its high concept, that of the zombie romantic comedy or zom-rom-com if you will. I suppose one could argue that R (Nicholas Hoult) and Julie (Teresa Palmer) do turn out star-crossed lovers, what with the former being an undead ghoul and the latter trying to ensure the survival of the human race. However, it’s worth noting that only our heroine’s family bears animosity toward the other camp. With good cause, might I add, seeing as zombies like to feast on the living’s noggins. Indeed, Warm Bodies follows the old brain-munching trope from Return of the Living Dead (1985) except with a cute philosophical twist. Though they can no longer express themselves, the undead in this story can still think and feel. This comes in handy in the first act, when R serves as our point-of-view character, but it raises the question, how can complex souls fully capable of compassion and guilt pounce at the living like paparazzi at a failed pop star? The answer carries with it a fair bit of poetry: feeding on a human brain gives the ghouls access to their victim’s memories, allowing them to experience life again for a brief moment. In other words, their insatiable hunger is an existential one. The unbearable solitude inherent to the undead lifestyle prompts some to give up on their humanity and tear their flesh off, becoming unscrupulous “bonies”, but R has got a more tenacious connection to the world around him. He collects trinkets, plays vinyl records in his airplane lair, and, of course, saves the woman of his dreams after eating her boyfriend (Dave Franco). I like how Warm Bodies takes the time to build the relationship between the two leads (as symbolised by our hero slowly coming back to life) before Julie reciprocates his affection, thereby bypassing some of the clichés associated with the rom-com genre, not to mention the necrophilia intrinsic to the premise. By the same token, a typical romantic comedy would’ve presented Julie’s initial love interest as an irredeemable jerk so as to attenuate her new one’s transgression. Warm Bodies takes a different route, portraying him as a decent, loving man who, like the aforementioned “bonies”, eventually lost his softness in the face of the undead apocalypse. Revealed in sporadic flashbacks as R snacks on his cerebrum, Perry’s tale proves a tragic one, making our heroes’ need for hope all the more palpable. As a result, when the very image of Julie and R holding hands begins to cure the latter’s entourage, spreading like a life virus in the zombie community, we find ourselves taken by the romance of the concept rather than incredulous of its logistics. Granted, the climactic confrontation between the humans, the reformed undead, and the “bonies” wraps up a little too neatly, especially when the film extends the metaphor to show love solving all of the world’s problems. However, I find it difficult not to get misty eyed at the sight of our hero’s notional best bud, M (Rob Corddry), slowly remembering his name, his wife, his ability to appreciate raindrops falling down his cheeks, and, by the end, his charming sense of humour. Perhaps my enthusiasm stems from a mistaken belief that I’d pretty much seen all the zombie genre had to offer, what with a straight-to-video Night of the Living Dead (1969) knock-off coming out every month and AMC’s The Walking Dead starting to run in circles after just three seasons. 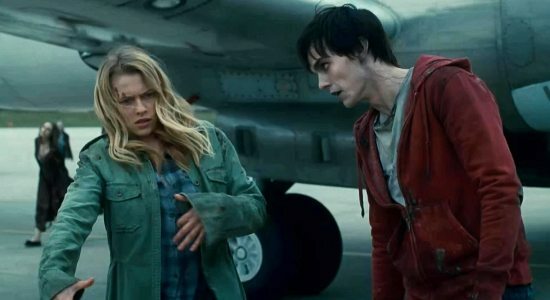 Warm Bodies proved me wrong, demonstrating that undead ghouls don’t have to tear everyone limb from limb the same way that romantic comedies don’t have to drown us in second-act fashion montages. Sure, some may find Levine’s unique take a bit jarring at first, but the final shot makes it all worth it: two young lovers watching the world come together as symbolized by a great big explosion.